Brazil’s right-wing presidential front-runner Jair Bolsonaro has undergone emergency surgery after he was stabbed in the stomach during a campaign event. The controversial congressman was knifed amid a crowd in the city of Juiz de Fora. 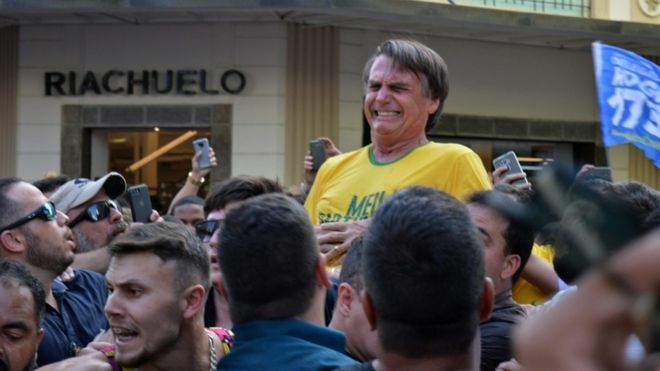 Videos shared over social media show that Bolsonaro was waving to the crowd when he suddenly clutches his abdomen and cries out in pain. Also, according to O Globo newspaper, he was wearing a bulletproof vest but was wounded just below it. Bolsonaro’s son Flavio opened up his father had suffered severe blood loss and arrived at the hospital ‘almost dead’. His surgeon commented the situation after the operation ‘His internal wounds were grave and put the patient’s life at risk’. For now, Bolsonaro is in a serious but stable condition and will remain in intensive care for at least for next week. In today’s volatile world, countries must be prepared to defend their interests and protect their people. It is the responsibility of a nation’s government to protect its land and its citizens from any threats. Brazil, Latin America’s largest economy, has seen some important security advancements in the past several years, implementing an ambitious plan. However, it still faces a huge number of crimes that, according to the latest events, have raised to a new level. As Reuters notes, “The attack on Bolsonaro, 63, is a dramatic twist in what was already Brazil’s most unpredictable election since the country’s return to democracy three decades ago. Corruption investigations have jailed scores of powerful businessmen and politicians in recent years and alienated infuriated voters.” The attack on the 63-year-old Bolsonaro showed that no category of people are immune from criminal attacks, even politicians of the highest level. For Brazil’s law enforcement agencies solving of this case is a matter of honor and they understand it should be done expeditiously. Over the last fifty years, technology has become a particularly important source of much needed innovation in modern society, which has further provided new opportunities for investigators too. Brainwave Science has developed an EEG/P300 based testing systems that determine with accuracy whether or not specific information is stored in a person’s memory. This technology is called iCognative, it brings an much needed assistance for law enforcement agents looking for means to cope with limited resources and challenging crimes. iCognative test makes it possible to quickly and accurately determine who from a group of suspects knows details about the crime that can be known only to the perpetrators. Apart from extreme levels of accuracy and reliability, this torture-free Brainwave Science technology is non-invasive and supports human rights. The whole test per suspect is completed in less than an hour. iCognative technology by Brainwave Science is based on proven, patent free, widely accepted neuroscience fundamentals of P300. Specific case related investigation details including some that are not made public via press/media outlets are used as stimuli to conduct a iCognative test. When such information is flashed in front of a suspect’s monitor as a test protocol for suspect to just observe, the brainwaves of the suspect are recorded and sent for analysis via a specialized proprietary Bluetooth headset only available for Brainwave Science customers. In the case of attack to Bolsonaro, given that the suspect has already been identified as Adelio Obispo de Oliveria the test can be easily conducted regarding his involvement in this crime. iCognative test protocol can be deployed using details such as : date and time of the attack – Thu, September 6th, 2018; the place where crime took place – Juiz de Fora; the weapon – pictures of used knife; photos of injuries etc., along with other details including witness accounts and motives known to investigators. During the test, iCognative system will determine if the suspect’s brain has concealed information and if the suspect is acting alone or is affiliated with other co-conspirators with over 99.9% accuracy. Brazil’s Federal Police must utilize the benefits afforded by cost-effective iCognative technology by Brainwave Science to solve this national problem. iCognative offers a unique and nearly flawless technology that nations can leverage to defend their people.